2. DELEGATES BY ABSOLUTE MAJORITY the local government functions listed in Attachment 3, pursuant to s. 5.24 of the Local Government Act 1995 and cl. 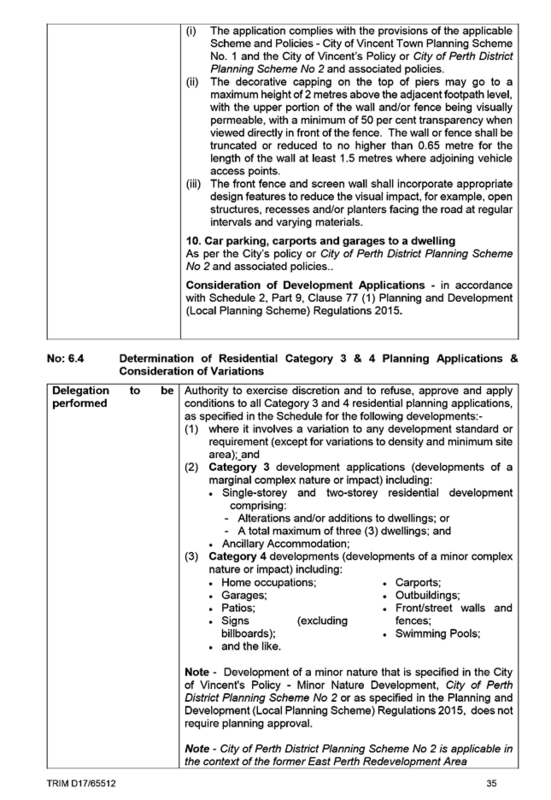 82 of Schedule 2 of the Planning and Development (Local Planning Schemes) Regulations 2015. 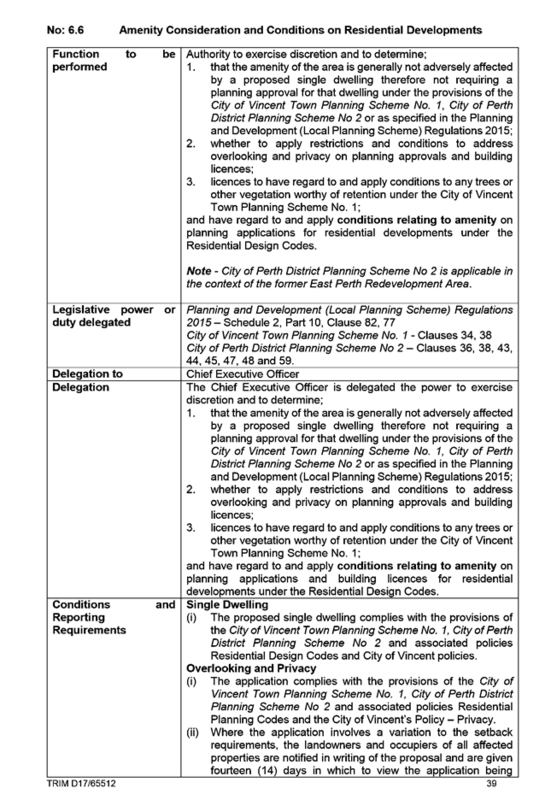 To consider amendments to the City’s Delegated Authority Register required as a result of the revocation of the City’s Town Planning Scheme No. 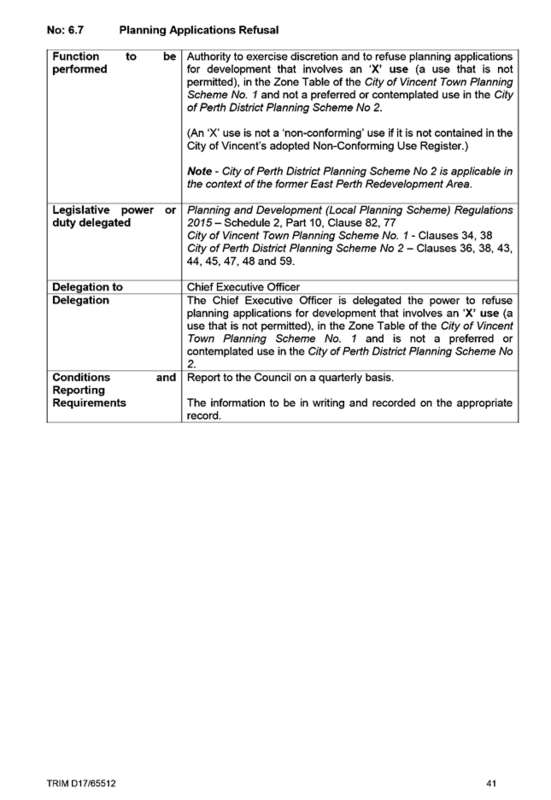 1 and the adoption of the City’s Local Planning Scheme No. 2 (the Scheme). At its meeting on 27 June 2017, Council adopted the 2017/18 Delegated Authority Register, which included 13 planning delegations under Part 6 of the Delegated Authority Register as shown in Attachment 1. 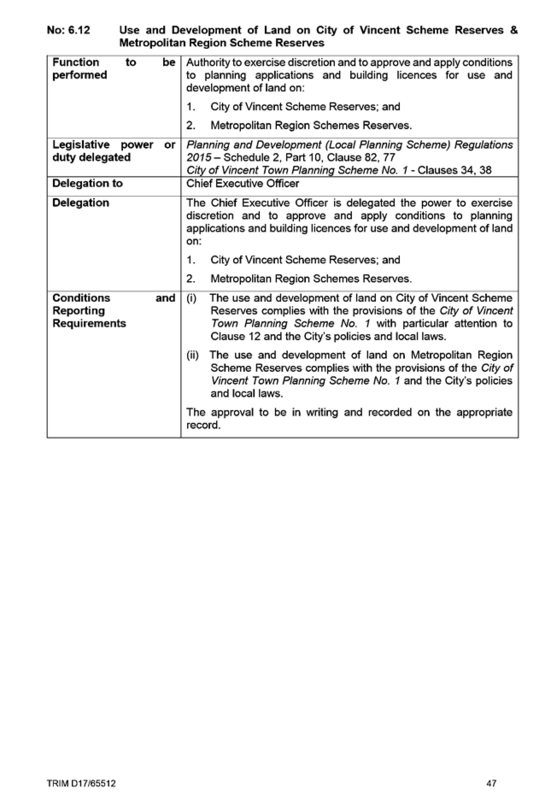 These delegations relate to the City’s planning powers as set out under the Planning and Development Act 2005, Metropolitan Region Scheme and City of Vincent Town Planning Scheme No. 1 (TPS1). 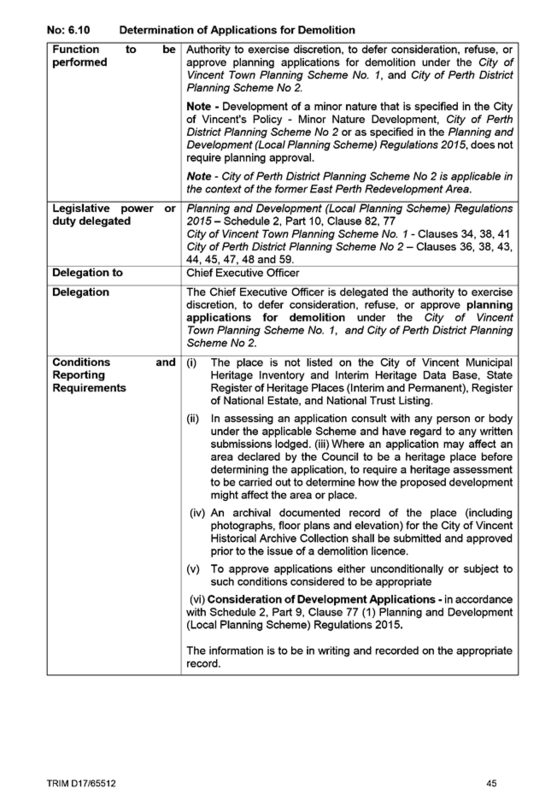 On 4 April 2018, the Acting Minister for Planning endorsed the new City of Vincent Local Planning Scheme No. 2 (LPS2), as a replacement to TPS1. LPS2 is scheduled to be gazetted and become operational on 16 May 2018 and TPS1 is scheduled to be revoked on the same day. The revocation of TPS1 will render the City’s current planning delegations ineffective and so it is necessary to amend the City’s delegations such that they apply to LPS2. Administration has undertaken a comprehensive review of the current delegations set out under Part 6 of the 2017/18 Delegated Authority Register. 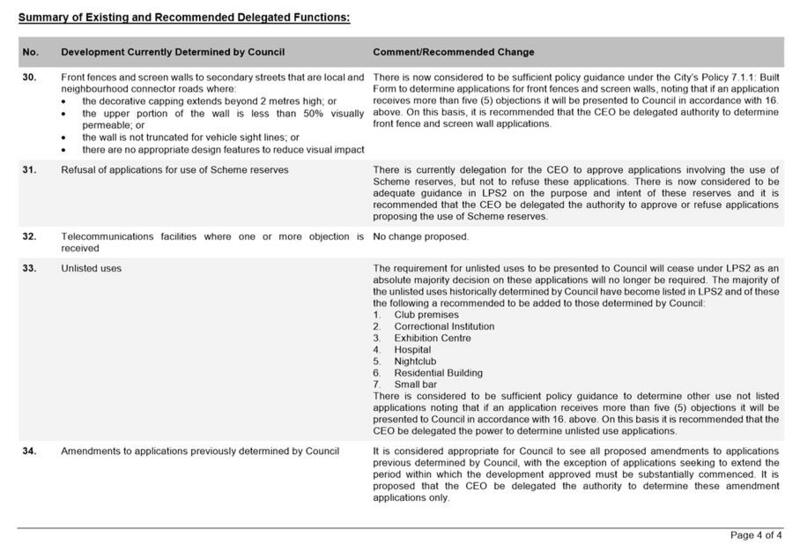 The results of this review, following consultation with Council Members, are set out in the summary of existing and recommended delegated functions included in Attachment 2. In addition the Delegated Authority Register has been amended to rationalise duplicate functions, remove obsolete functions, and clarify the remaining functions. 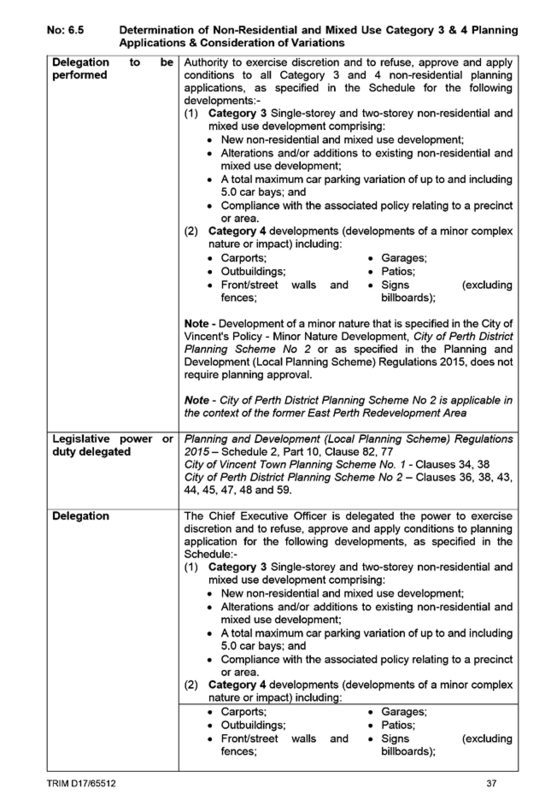 The amended Register now contains only two separate functions delegated from Council to the Chief Executive Officer (CEO), one for compliance related matters provided for under the Planning and Development Act 2005 and the other for the ability to determine applications for development approval under Local Planning Scheme No. 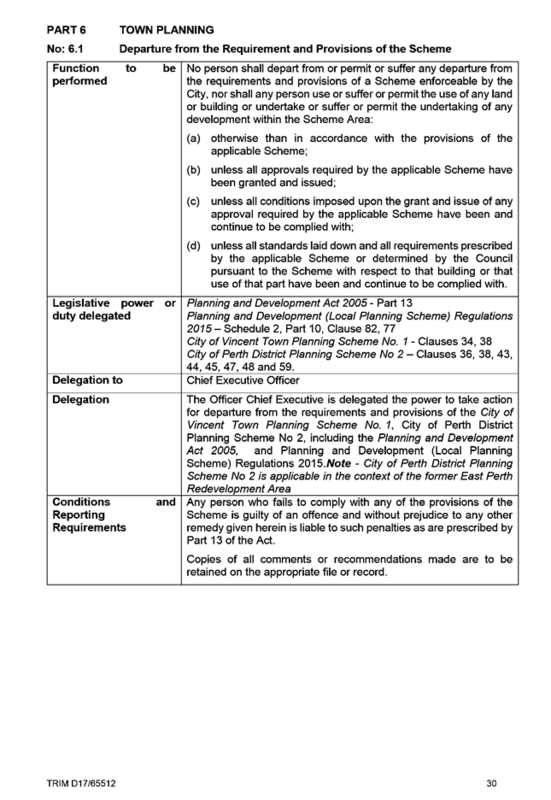 2 and the Metropolitan Region Scheme. 1. 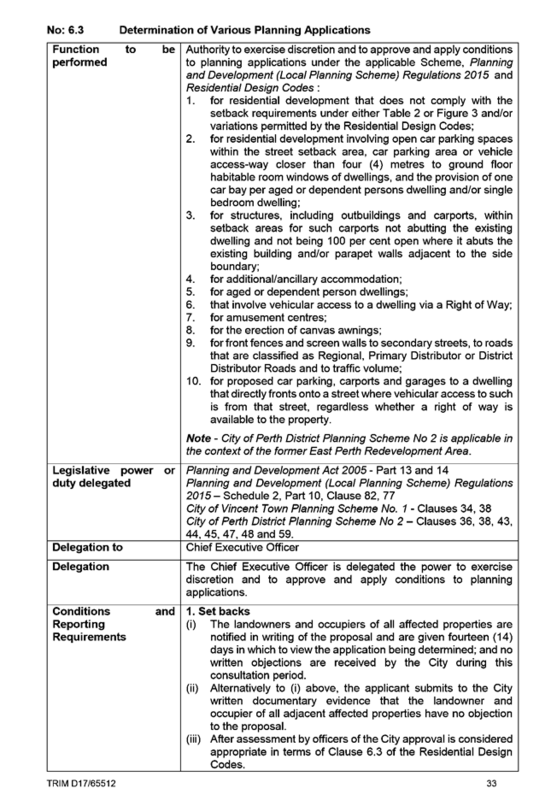 Car Parking Shortfalls – Currently Council considers any application that proposes a car parking shortfall of more than five bays under Table 1 of the City’s Policy No. 7.7.1: Non-Residential Parking Requirements. This requirement is proposed to be retained and clarified given the recent amendment to that Policy. These recent amendments have also changed the way cash-in-lieu requirements are assessed. 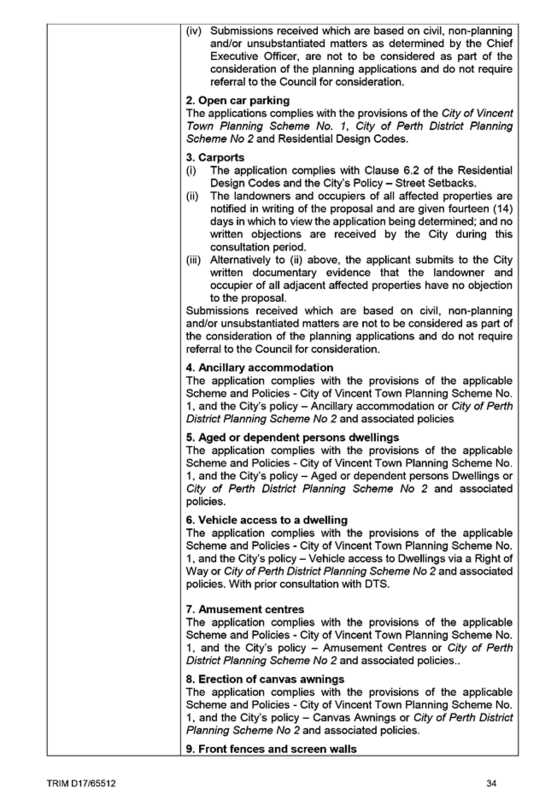 Given this, it is recommended that this delegation be further amended to require Council to approve the waiving of cash-in-lieu or reciprocal parking arrangement where the development does not meet the applicable car parking minimum set under Table 1 of the Policy No. 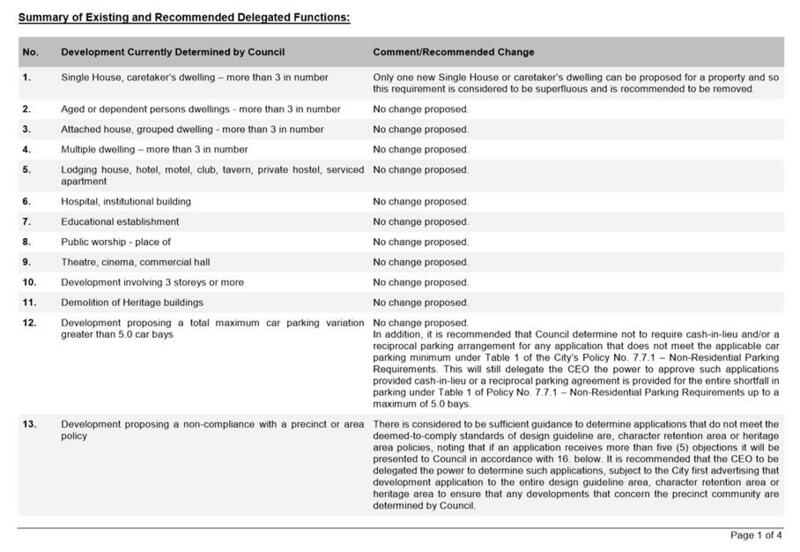 7.7.1 – Non-Residential Parking Requirements. 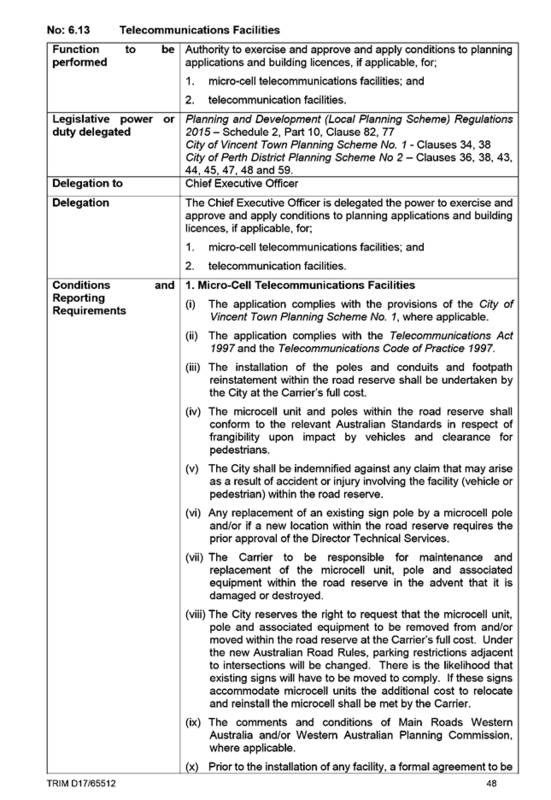 This will still delegate the CEO the power to approve such applications provided cash-in-lieu or a reciprocal parking agreement is provided for the entire shortfall in parking under Table 1, up to a maximum of 5.0 bays. 2. 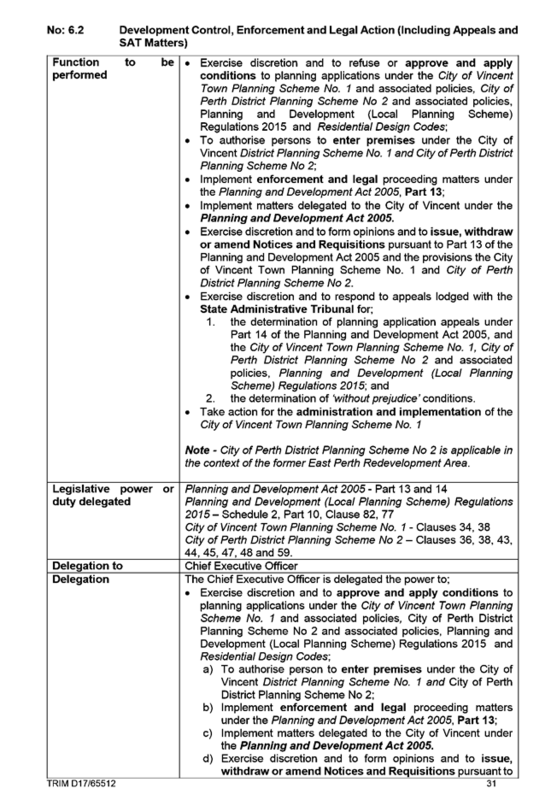 Variations to precinct policies - Currently a development that varies any of the standards applicable in a precinct policy including the City’s various design guideline area policies and Policy No. 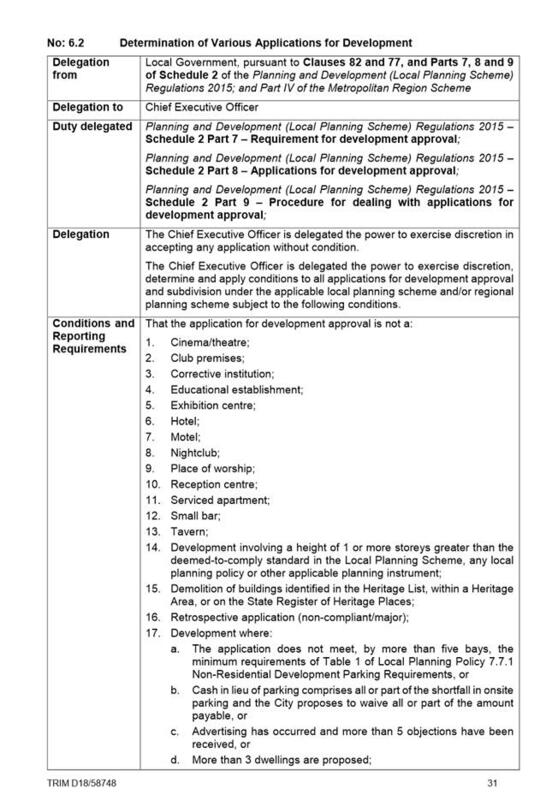 7.5.15 Character Retention and Heritage Areas requires the approval of Council. This includes minor variations, such as front fence infill for metre boxes and or setback protrusions. 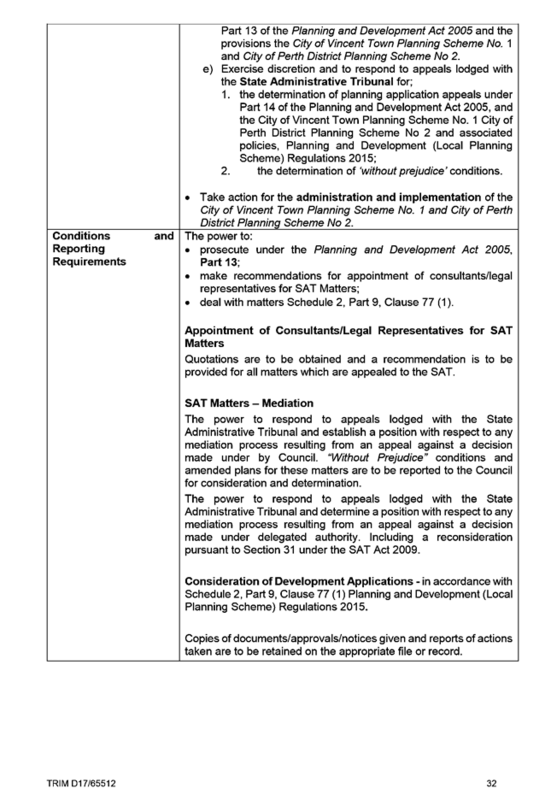 Rather than require all variations to be presented to Council it is considered a better approach to require that all development applications lodged within a design guideline, heritage area or character retention area be advertised for comment to that entire area and that if more than five objections are received the matter be presented to Council for determination. 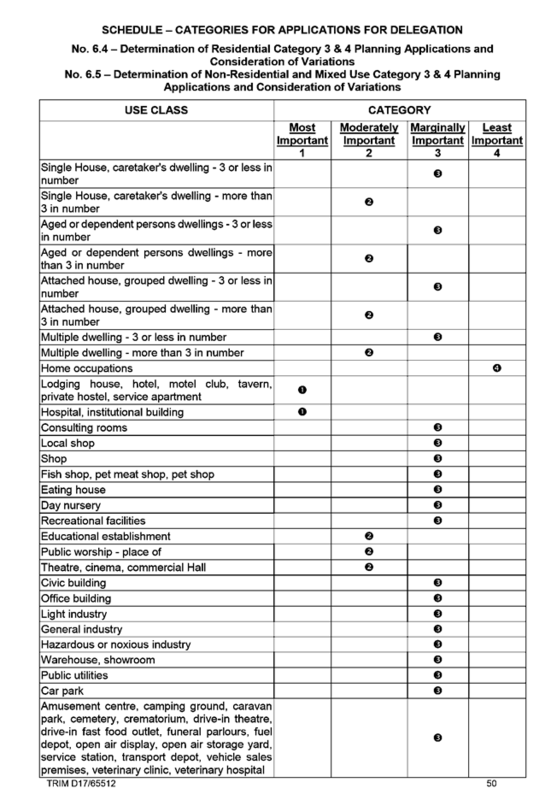 Given the performance based approach now being taken in the Character Retention and Heritage Areas Policy and Built Form Policy, it is recommended that determination of minor variations occur under delegated authority. This will ensure that only applications of community interest are presented to Council and ensures a consistent approach across all applications. 3. Refusal of applications – There is currently delegations for a number of application types to be approved under delegated authority but not refused. There is considered to be adequate guidance under LPS2 and the City’s policies to allow the CEO to also refuse these types of applications and it is recommended that the delegations be extended to allow this to occur. 4. 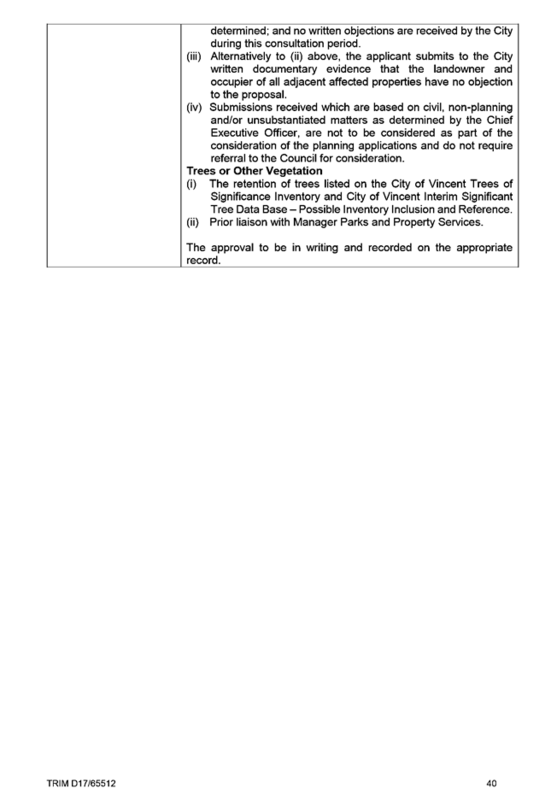 “SA” Uses with one objection – Currently Council is required to determine any application that received more than five objections, except where the use is listed as an “SA” use under TPS1, where one objection triggers the requirement for an application to be presented to Council. The terminology for “SA” uses will change to “A” uses under LPS2. There is not considered to be any significant difference between “A” uses compared to other discretionary uses such as “AA” or “D” uses. 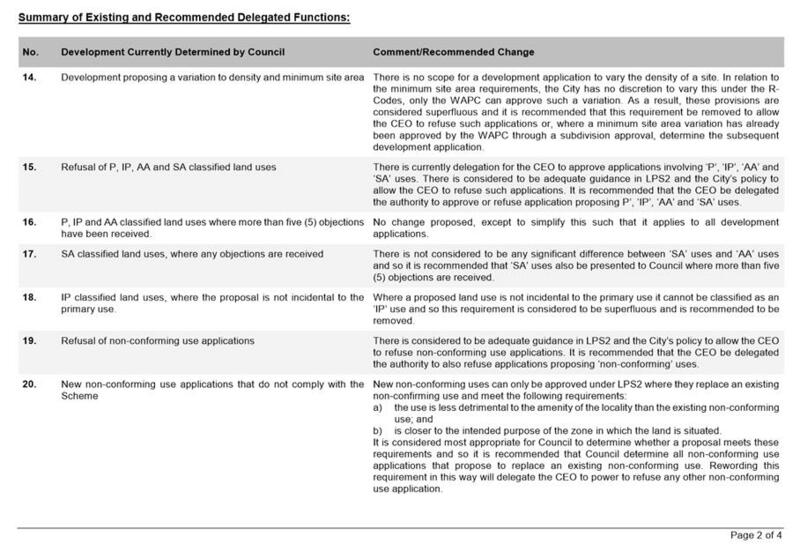 The “more than five” objections trigger is considered to appropriately capture those applications that are of community concern and warrant formal consideration by Council. 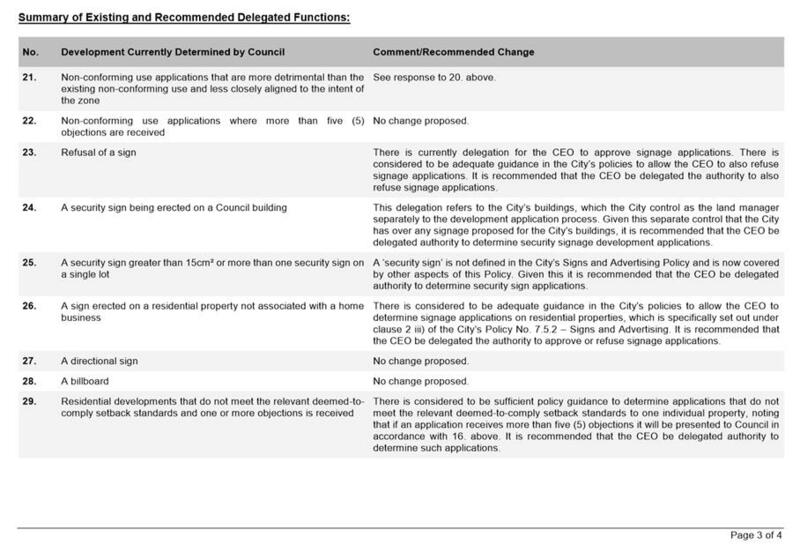 Given the above it is recommended that “A” uses also be presented to Council where more than five (5) objections are received. 5. 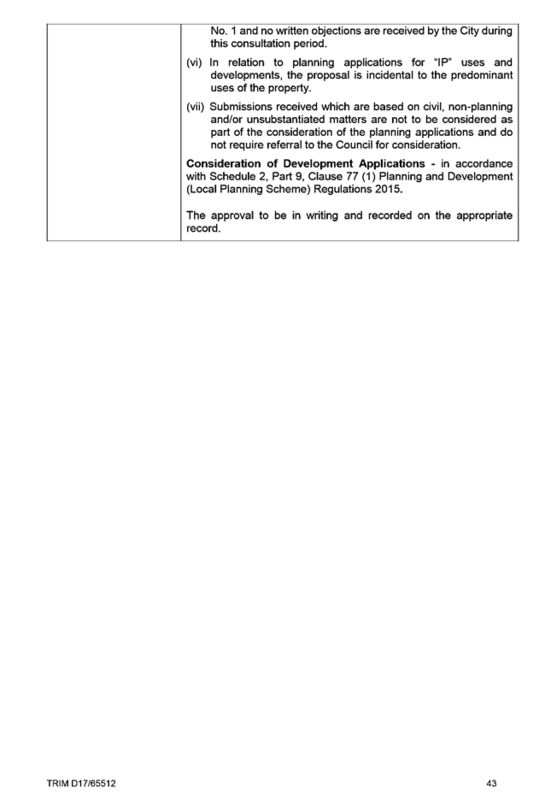 Amendments to Council decisions – Currently Administration’s practice is to present to Council all applications that propose to amend a decision of Council. This is not specifically stated in the current delegations and so it is recommended that the delegations be amended to clarify this requirement. It is also recommended that the CEO be granted delegation to determine applications seeking to extend the period within which a development previously approved by Council must be substantially commenced. 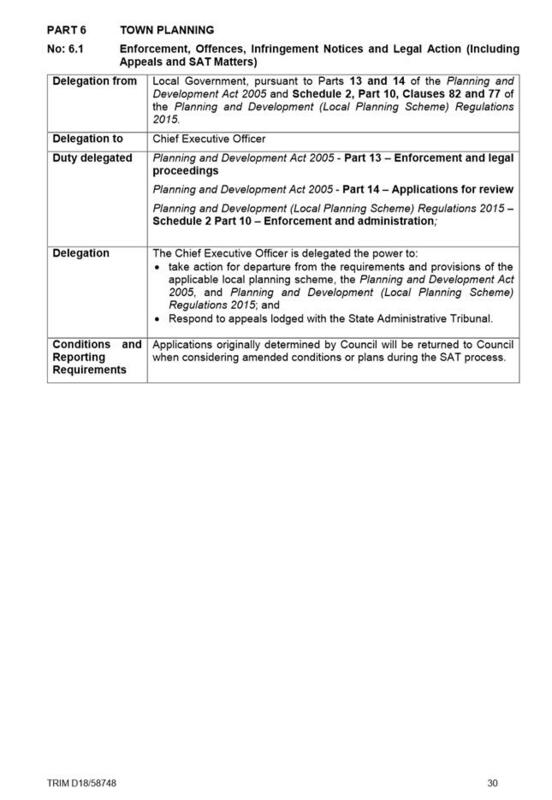 A list of all changes to the Delegated Authority Register is included as Attachment 2 and the proposed new planning delegations are included as Attachment 3. No advertising or public comment is required under the relevant legislation. 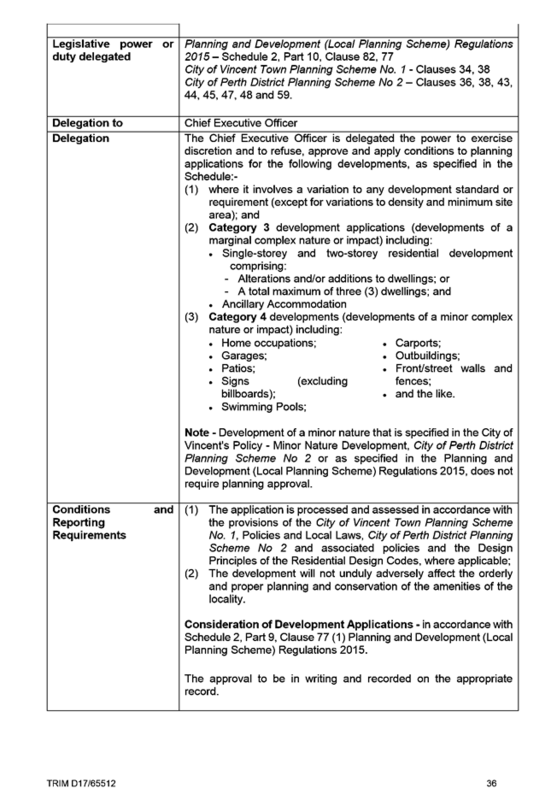 · Local Planning Scheme No. 2. 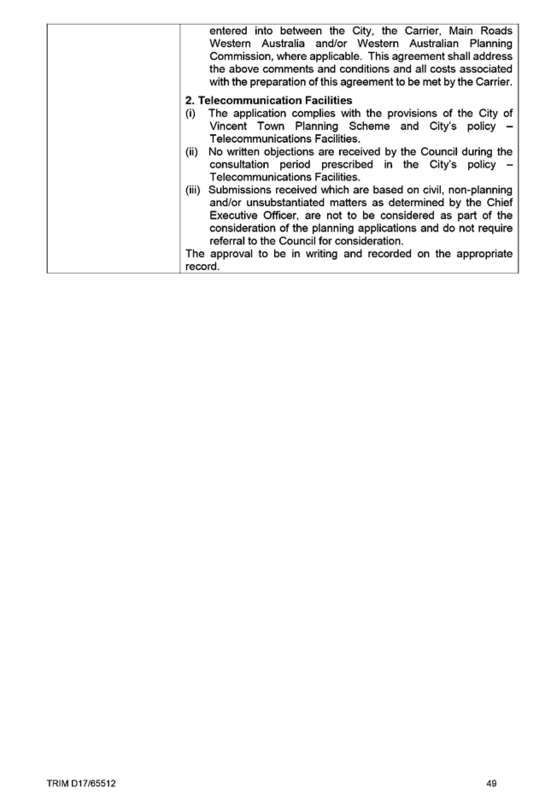 Section 5.46(2) of the Act requires Council to carry out a review of its delegations at least once every financial year. Medium: Delegating the powers of a local government introduces a risk that those powers may be used in a manner that is contrary to Council’s view. This risk is mitigated by imposed conditions on delegations, guiding policies, appropriate training which defines clear authorities, and accountabilities for City officers. The risk is also mitigated by the requirement to record and report decisions made under delegated authority. 4.1.2 Manage the organisation in a responsible, efficient and accountable manner”. This item will have negligible impact on the City’s sustainability targets. The cost of implementing this proposal will be met by the City’s existing operational budget. The amended Delegated Authority Register removes significant confusion from the operation of the existing delegations. There is no longer any overlap or contradictions between delegations, the correct clauses and legislation are referenced, obsolete functions have been removed, and the remaining functions have been worded in a clear manner that can be understood and implemented consistently. The general level of delegation has been maintained, with the exception of those types of applications set out in the Detail section above, which are deemed more appropriate to be determined by the Council or the CEO. 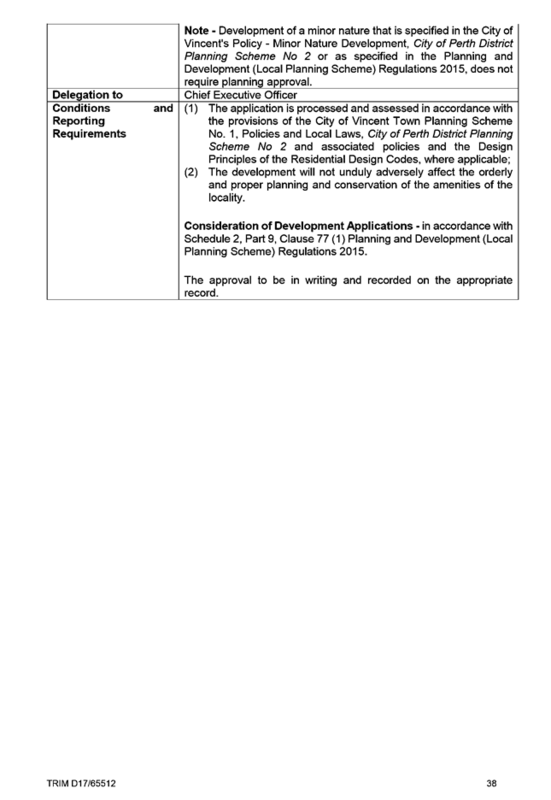 It is considered that these changes will ensure applications that impact on, or are of interest to the community are considered by Council as part of the Council Meeting process and that minor applications can be determined under delegated authority. 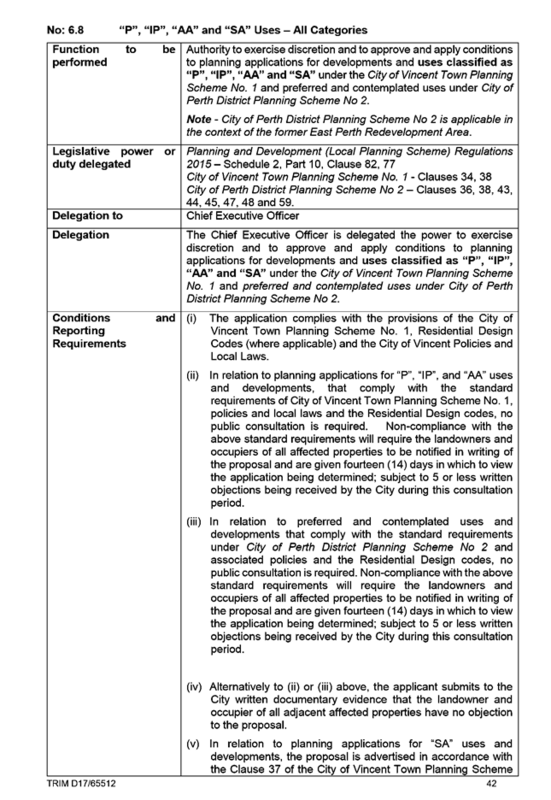 It is recommended that Council adopt the proposed new planning delegations as included as Attachment 3. That Council APPOINTS of Price Consulting Pty Ltd to conduct the Chief Executive Officer’s Performance Reviews for 2017/18 and 2018/19 in accordance with Policy 4.2.16 – CEO Annual Performance Review. To consider appointing a Human Resources Consultant to assist Council in conducting the Chief Executive Officer’s (CEO’s) annual performance review for the 2017/18 and 2018/19 periods. At its Council Meeting on 14 November 2017, Council adopted Policy No: 4.2.16 – CEO Annual Performance Review (the Policy). The Policy sets out that a CEO Performance Review Panel will be established to oversee the CEO Annual Review Process and that the Panel shall comprise up to four members, including the Mayor as Chairperson and at least two other Council Members. Mayor Emma Cole, Cr Gontaszewski, Cr Topelberg and Cr Loden were appointed to the Chief Executive Officer Performance Review Panel at the Council Meeting held on 30 January 2018 2017 for a term expiring on 18 October 2019. 1.1 The Council shall establish a CEO Performance Review Panel (the Panel) to have carriage and oversight of the Annual Review Process. 1.2 The Panel shall be appointed by resolution of Council for a two year term ending on the date of the next ordinary local government election. 1.3 The Panel shall comprise up to four members, including the Mayor as Chairperson and at least two other Council Members. (f) Discuss possible KPIs and measurements with the CEO for reporting to Council arising from the performance review process." 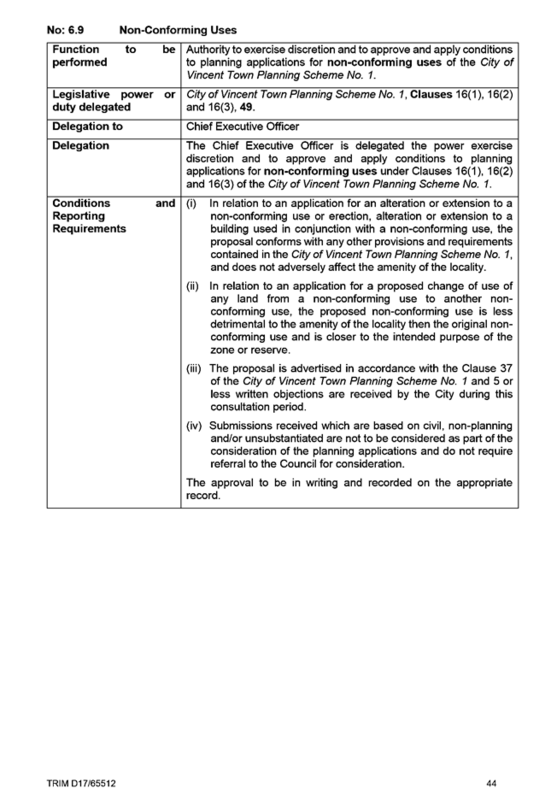 The Policy also states that, unless otherwise determined by Council, the selected consultant shall be appointed for a two year term to coincide with the membership term of the Panel. A formal request for quotations to conduct the CEO’s 2017/18 and 2018/19 Annual Performance Reviews was sent to five (5) suitably qualified human resources consultants on 9 April 2018. Each consultant was provided with identical information and was requested to describe their experience and recommended methodology for conducting the performance review in relation to the requirements under the Policy. 4. Services fit for the requirements under the Policy. 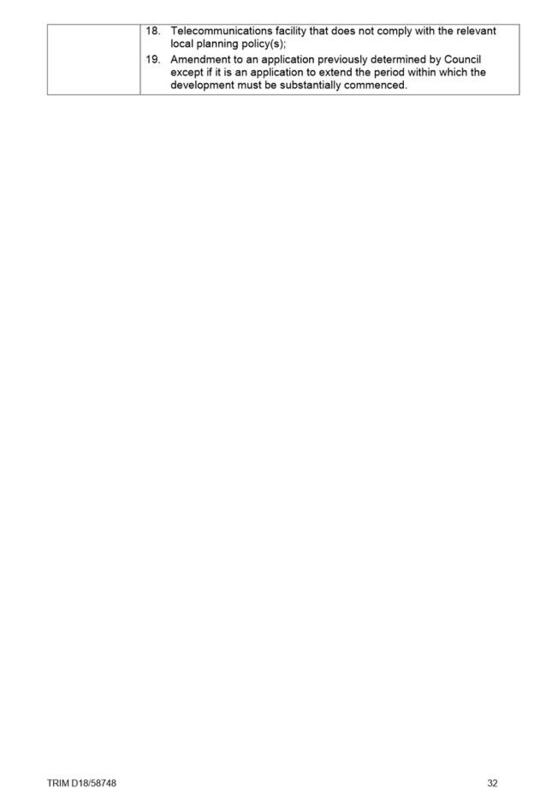 A summary of the quotations received is included as Confidential Attachment 1. A complete copy of each confidential quotation submission was provided to all Panel Members and is included as Confidential Attachment 2. 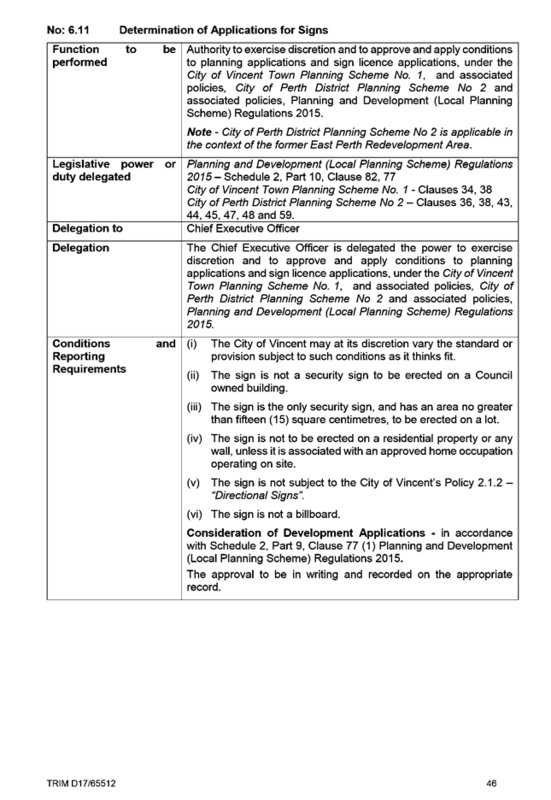 City of Vincent Policy No: 4.2.16 – CEO Annual Performance Review sets out that a CEO Performance Review Panel will be established to oversee the CEO Annual Review Process, and outlines the primary functions of the Panel in carrying out the review. The review of the CEO’s performance is an important opportunity for Council to evaluate the CEO and the City’s performance against Council priorities and the City’s Corporate Business Plan. It is also important to engage in constructive dialogue with the CEO about past performance and the future direction of the organisation as well as to define Council’s future aspirations, expectations and Key Performance Indicators for the position of CEO. The summary of the financial value of the three quotations received to conduct the CEO’s Performance Reviews is included in Confidential Attachment 1 given the commercial-in-confidence nature of the information. There is budget available in order to engage a consultant to conduct the CEO’s annual performance review and the estimated cost of the recommended consultant is within budget. There was significant variation in the cost proposed by consultants to conduct the CEO’s Performance Review. While some costs reflected differences in approach by consultants, it was the Panel’s assessment that not all costs could be clearly attributed to such variations in process. The Panel gave careful consideration to the proposed process and recognised that despite the current CEO, Len Kosova, tendering his resignation on 11 April 2018 he remains available for the 2017/18 performance review. An annual CEO performance review is a legal requirement under the Local Government Act 1995 and is a critical organisational review process that will be used to inform future organisational direction, priorities and revised Key Performance Indicators for a new CEO. As a consequence, the Panel is recommending that the review process continue regardless of the CEO’s resignation. 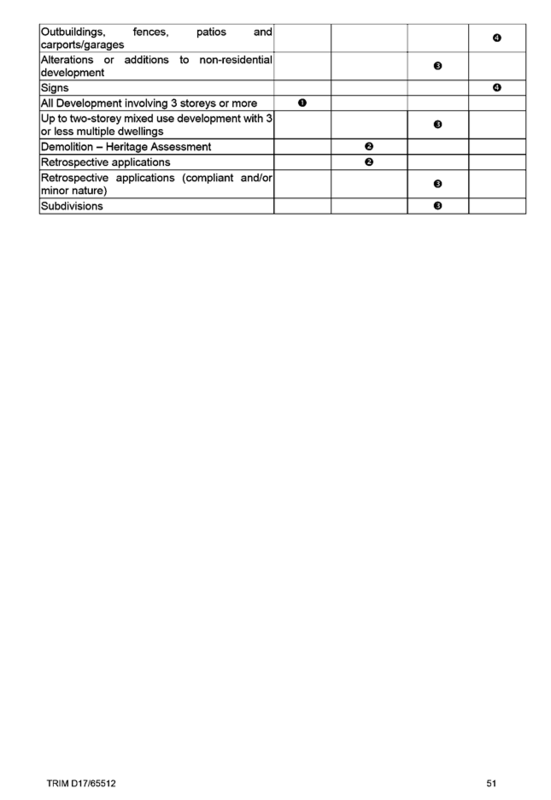 It is the view of the Panel, following consideration of the assessment criteria that the methodology outlined in the submission from Price Consulting Pty Ltd was well considered, thorough and provided for sound engagement with Councillors to ensure an accurate review of the CEO’s performance. The Panel also agreed that the services and methodology offered meet the requirements of the Policy and the Request for Quotation provided. The Panel also considered that the price submitted from Price Consulting Pty Ltd appropriately reflected the level of engagement proposed and represented very good value for ratepayers. 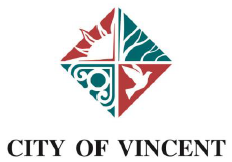 The nominated consultant, Ms Natalie Lincolne, demonstrated substantial, recent and relevant experience in conducting CEO performance reviews and has performed well in recent CEO performance reviews conducted for the City of Vincent. On the basis of the above, Natalie Lincolne from Price Consulting Pty Ltd is considered to be the most appropriate consultant to carry out the CEO performance reviews over the two year term.